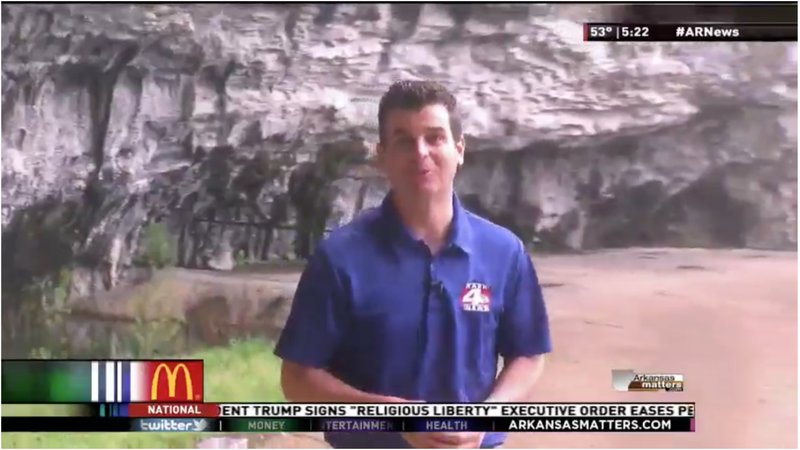 Beckham Creek Cave Lodge in the Arkansas Ozarks welcomes visitors to its renovated cave bedrooms. The cavernous ceilings, walls of rock and a natural waterfall in the center of the main room let you feel close to nature without being uncomfortable, while guaranteeing stunning acoustics for movies on TV. The hotel is structured more like a house — hence “lodge” — with a kitchen, main room, five full bedrooms (with their own baths) and a recreation room. Nested in a natural cavern, high within a bluff overlooking the valley, Beckham Creek Cave in Arkansas describes itself as being ‘unlike any other place on earth’. 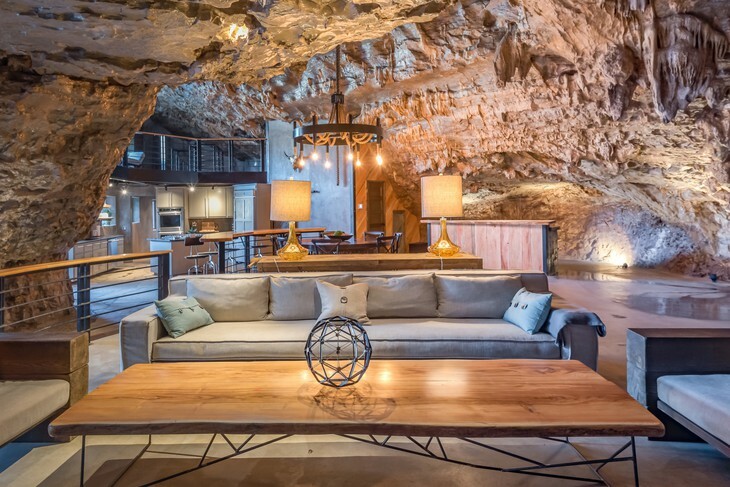 Completely remodelled with slick contemporary furnishings, the cave-style home is set within a private 260-acre resort, offering total peace and quiet. The unusual abode offers four luxurious bedrooms and four bathrooms to sleep eight people. Eight more guests are welcome to stay in the property providing they take their own sleeping mats. Rates start at $1,200 per night. There is also a state-of-the-art kitchen with high-end gas appliances and double convection ovens. Hiking, canoeing, fishing, helicopter rides, and horseback riding are all activities that can be arranged via the resort. Exclusive, incredible and expensive – staying there will cost you about $1,600 per night. Nestled into a living cave, Beckham Creek Cave Lodge, is a 6,000 sq. ft. lodge with every modern amenity you can imagine, wrapped into a natural cave. The cave hotel is in the Ozark Mountains just minutes from the Buffalo National River. There are cavernous ceilings, walls of rock and a natural waterfall in the center of the main room. You won’t believe this incredible lodge. Set in the gorgeous Ozarks, in the incomparable Buffalo River Valley, Beckham Cave Lodge offers a truly unique experience. 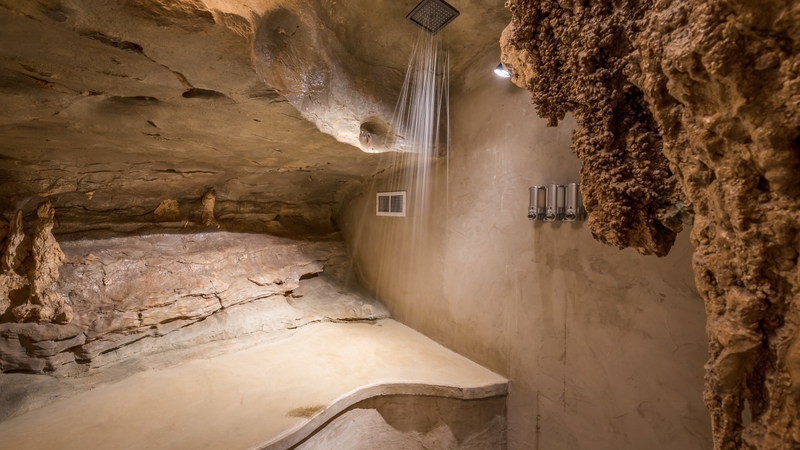 Newly remodeled, the cave lodge has maintained the breathtaking natural formations that make it so exceptional. With fully modern accommodations, it offers luxury wrapped in rock and set up in the mountains. The lodge is frequently placed on lists that tout it as one of the most unique places in the world to stay the night. And guess what, guys? It’s right here in Arkansas, near the small community of Parthenon. Way before David Beckham kicked a football Beckham Creek was hanging around being beautiful and waiting to be discovered. Now a 280 acre estate, the centerpiece is the amazing cave lodge. It took four years to build with the outside façade full of windows to let light into the cave. 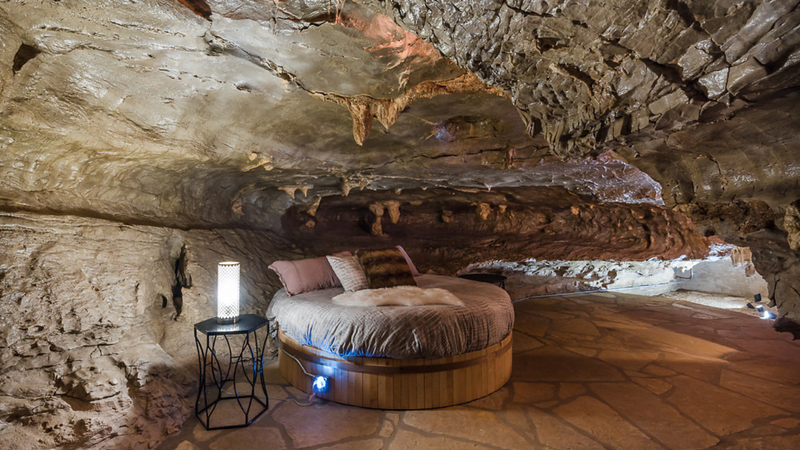 Check out these photos… isn’t it amazing how they have created a luxurious living space inside a cave? And they have done all this without taking away the rock walls or natural waterfalls. Set in the magnificent Buffalo River Valley there are plenty of activities to enjoy. The main one here is obvious. Can you guess what it is? Yes, it’s caving or “spelunking” as it is sometimes known. The cave system runs into the earth revealing a mysterious world of underground lakes and natural caverns ready to be explored. You can also go rock climbing, take a nature trail and go horse riding. There is a large games room for socializing and a modern kitchen. 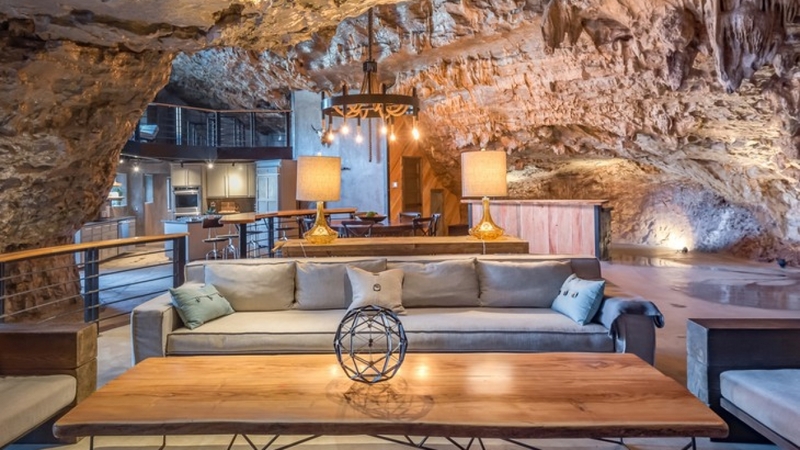 Located in Parthenon, Arkansas, this Flintstones-style home is built into a cave, and has been purposely renovated in a way to keep the features of the cave and its authenticity. It’s been converted into a lodge so you can stay in the lodge for around US$1,200 a night out of season, but in peak holiday seasons prices pump up to around $2,000. NEWTON COUNTY, Ark.- Just North of the Ozark national forest in rural Newton county, is a road that leads to one unique spot in our state. A place that is both natural and constructed, a grotto of elegance. At every turn you’ll find formations, cave growth that can’t be stopped. The water you see is the water you get, whether it is used for drinking, cooking or taking a shower. However the excess water makes a mark like no other. With your reservation, comes all the outdoor you can handle. Exclusive, incredible and expensive – staying there will cost you about £1225 ($1,600) per night. 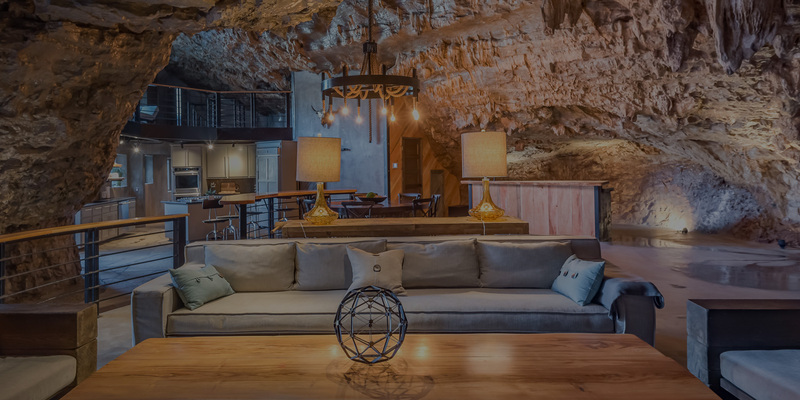 Nestled into a living cave, Beckham Creek Cave Lodge, is a 6,000 sq. ft. lodge with every modern amenity you can imagine, wrapped into a natural cave. 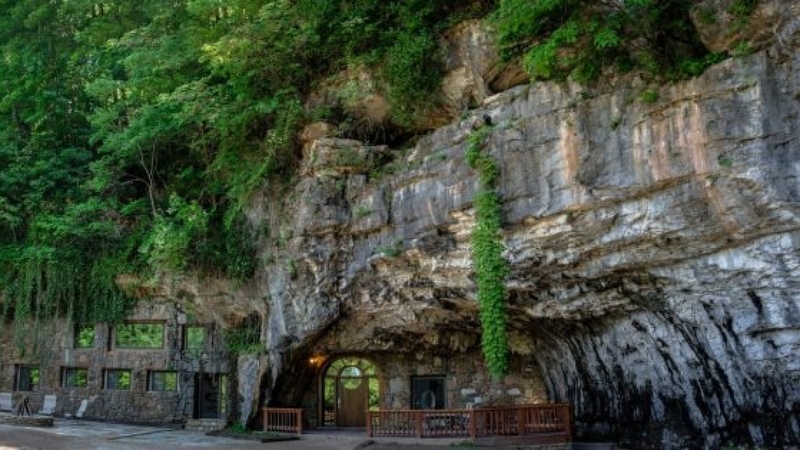 The cave hotel is in the Ozark Mountains just minutes from the Buffalo National River. There are cavernous ceilings, walls of rock and a natural waterfall in the center of the main room.